“He was a good man who did good things”, assessed Bob Edwards, long-time friend, one-time employer and a partner with Peter Brokensha in early efforts to turn the nascent Aboriginal art movement into a viable business. Coincidentally, the Pitjanjatjara people with whom Brokensha spent time, also referred to him as Wati waru – a good man. South Australia, where Brokensha was born and died, was another connection between this trinity. But it was in Sydney that he created his most significant physical achievement – the Argyle Arts Centre in The Rocks. Having dabbled in pottery, the then-business executive wanted a place where craft and art could be displayed and sold, so converted the 1828 Bond Store into a place for potters and leather-workers, goldsmiths and jewellers to have studios. It opened in 1970, and also housed the first dedicated 'primitive' art gallery in Australia run by Peter's wife Elizabeth (nee Douglas). The gallery would give work experience to Indigenous curator Djon Mundine and Aboriginal art gallerist Gabriella Roy. Sadly, the Centre is now all bars and restaurants. Peter Brokensha had an unhappy childhood thanks to an alcoholic, travelling salesman father straight out of Arthur Miller, and chose the Communist Party for company at university where he studied engineering in the late 40s. This wasn't a problem when he joined the SA Harbors Board, but required negotiations with ASIO when he was recruited by Caltex as its first graduate trainee in 1952. Fifteen years later, Brokensha was Director of Operations and on the Board of Caltex Oil (Australia). But US head office interference, pottery and the Argyle Arts Centre project were all leading him astray, to the amazement of the press which headlined his resignation from Caltex, “Oil Executive Switches to Art : Maybe I'm nuts, he quietly says”! In fact, he was in precisely the right place when the Australia Council created an Aboriginal Art Board lead by anthropologist/Director, Bob Edwards, which soon had a bulging storeroom full of the new acrylic art from Papunya which no one wanted to buy. “There were barks from the north, which did sell”, explained Edwards, “the acrylics were dismissed as 'tourist art', and there was lots of craft work. Everyone was doing their own thing; over-production, poor quality control and hopeless storage”. Peter Brokensha was the man to sort it out – selling his now two galleries in Sydney into the government's Aboriginal Arts & Crafts Ltd, which had outlets in Darwin, Alice, Adelaide and Perth. In 1975/6, these had received subsidies of $442,000 but managed a turnover of just $277,000. In three years, Brokensha boosted this to a million dollars. He was also doing an anthropology degree including fieldwork with the Pitjanjatjara in the Great Victoria Desert. Amata was a government settlement created by governments in 1961, but most tribes-people lived in camps away from its racist white officials – and Brokensha chose to join them. At first he was alone, later with a family, which now included three teenage children - Sally, Nick and Anne. His most significant publication – 'The Pitjanjatjara and their Crafts' – emerged from this time, placing cultural value on hot-wire decorated coolamons and miru (spear-throwers) made laboriously from mulga roots, and then recommending quality control – including enforced burning of inferior product – which would allow it to find a market. 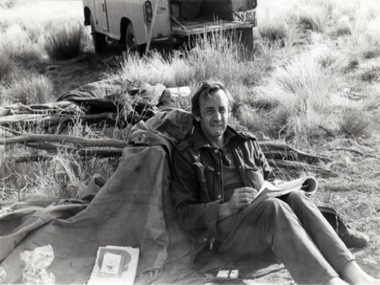 The three editions of this report record political advances that had Brokensha's support – the homeland movement in '75, the Pitjanjatjara Council established by 1978, and land rights, promised by Don Dunstan – a fellow member of the uni Socialist Club – in 1979, eventually delivered in 1981. The Brokenshas would return to Adelaide in 1980 to be close to Peter's aging mother, and would find another historic building – Randells Mill in the Adelaide Hills – to convert into a gallery for Elizabeth to sell the first Papunya art to the SA Art Gallery. Peter would develop an academic career, setting up the country's first arts management course at the SA Institute of Technology. This achieved an international reputation, leading to his lecturing in Britain, France, Germany and Sweden. He'd also publish reports on corporate ethics, cultural tourism and the huge financial contribution of the 1984 Adelaide Festival to State coffers. In 2005, son Nick, a successful fashion photographer based in Paris, died suddenly from cancer; both parents subsequently suffered strokes, Elizabeth pre-deceasing Peter. Daughter Sally is with the UN in Central America, emulating Peter's long involvement with Community Aid Abroad. Annie has taken the arts track, working in Sydney as a gilder. Peter Brokensha's post-Caltex achievements certainly justified the realisation in his autobiography, 'Coming to Wisdom Slowly', that there was more to life than “working to provide bigger dividend cheques for a bunch of widows in Florida”!